THE TOTAL NUMBER of dogs euthanised in 2017 by local authority pounds was 996, a reduction of over 40% on the previous year. The Minister for Rural and Community Development Michael Ring said the figures show there is a continuing trend in the decline in the number of dogs being euthanised – down from a high of just over 21,000 in 2002. The figures for last year show that 11,559 stray dogs were held by pounds last year. Of this number, 3,135 stray dogs were surrendered, while 194 were seized by the authorities. 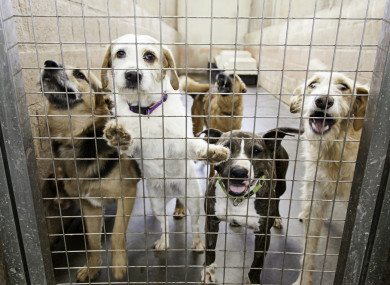 Over 2,061 dogs were reclaimed, while 2,726 were reclaimed. Greyhounds are particularly susceptible to abandonment. In 2017, 215 were either surrendered or seized by authorities and placed in the local pound. Just 20 were reclaimed or rehomed, 114 were transferred to dog welfare groups and 80 were put down. Independent TD Mattie McGrath asked the minister about the number of “dangerous dogs” that have been euthanised, however, the minister explained that the data recorded in respect of the numbers of dogs euthanised does not differentiate between breeds that are included in the Control of Dogs Regulations 1998, and those that are not. Dogs that fall under that Act include the American and English Pit Bull Terriers, Alsatians, and Rottweilers. In 2017, 2,476 on-the-spot fines were issued to dog owners in breach of the law on dog control, however, just 766 paid the fines. There were 191 prosecutions under the law, but only 99 convictions. McGrath told TheJournal.ie that he welcomes the significant drop in the number of dogs being euthanised by local authorities. He finds it “very worrying” that local authorities had a combined income from the operation of the Control Of Dogs Acts amounting to over €3.9 million in 2017. However, the incurred expenditure was above €6.2 million – leaving a deficit of €2.3 million, he said. “What I want to know is has this budget deficit impacted vital projects like social housing builds or refurbishing vacant dwellings? Only Cavan, Dublin City and Kerry had a surplus in 2017. Clearly something is very wrong in the enforcement of the Acts,” said McGrath. Under the Control of Dogs Acts, local authorities are solely responsible for operating and managing dog control and licensing services in their administrative areas and the Department has no direct role in this regard. Accordingly, any issue in relation to budgetary management is a matter for the relevant local authority and one in which the department has no role. Email “Number of dogs being 'put down' by pounds falls by 40%”. Feedback on “Number of dogs being 'put down' by pounds falls by 40%”.